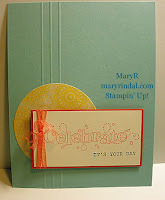 Here's another Sneak Peek at one of the exclusive Sale-A-Bration sets called Outlined Occasions. 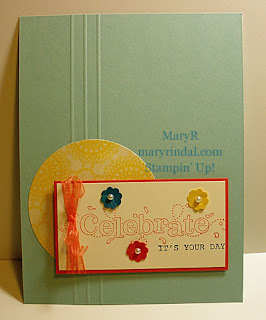 This card also features a bit of the Calypso Coral Ribbon from the SAB exclusive Everyday Enchantment Ribbons and Brads. Either of these products are yours to choose for FREE during Sale-A-Bration with every $50 order. Sale-A-Bration starts January 24th this year and remember you get to choose one free SAB product for every $50 you spend. Host a workshop during SAB for even more free product. Join Stampin' Up! during SAB for free product for the next year! I think there are a few elements on this card that really make it pop as a CELEBRATE card. The vertical score lines that I added with the Simply Score Tool grounds the image, without taking away from the pop of color. But I especially love how simply adding a few colorful flowers from the Itty Bitty Punch, with Pearl centers naturally, really makes it a 'happy' card. To illustrate the difference the flowers make, look at this same card without the flower punches.